The most important part of your horse’s diet is fibre. Fibre is a generic term referring predominately to forages such as grass, hay and haylage, but also includes alternative ‘forage replacer’ products such as high fibre pellets, alfalfa and grass cubes and short chop forages. Fibre is essential for a healthy hindgut fermentation in the horse and can provide the majority of nutrient needed by horses even in moderate levels of work. However modern forage and grazing can be lacking in essential nutrients, so it is important to balance any deficiencies. These are created for the horse by the micro-organisms in the hindgut when their diet consists of plenty of fibre – however stress and illness, amongst other factors, can disrupt the fermentation process in the hindgut which leads to a deficiency in B-vitamins. B-vitamins include Vitamin B12, B6, B1 and B2, Folic acid, Niacin and Biotin and have a host of benefits to promote all round health. Minerals are important in a number of physiological functions and should be consumed in small amounts but still play a vital role in maintaining health. Macro minerals are needed in larger amounts and include Calcium, Phosphorus, Potassium, Magnesium and Sodium, whilst Micro minerals are needed in much lower amounts and include Copper, Iodine, Iron, Manganese, Selenium and Zinc. These are the building blocks of protein, which help to build all body tissues, particularly muscle. 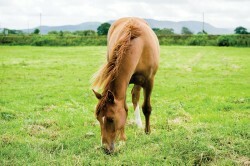 Our horses naturally produce some amino acids, but many they cannot, including lysine and methionine. Nutrients such as Vitamin E and Selenium help to prevent damage to any cells when free radicals are produced during normal metabolic function. Anti-oxidants are vital for maintaining a healthy immune system. Fatty acids are components of oils and fats. Omega 3 and Omega 6 are types of fatty acids and are vital for maintaining overall health and wellbeing. Fatty Acids help ensure healthy skin and coat along with assisting in maintaining joint function. When fed alongside Vitamin E and Selenium, fatty acids from oil are valuable forms of slow release energy. Horslyx provides a cost effective and simple way to balance your horse’s natural, forage based diet and has been formulated to complement the deficiencies often found in grazing. The palatable lick contains a comprehensive vitamin, mineral and trace element package alongside vital anti-oxidants to support the immune system, oil to benefit the skin and coat and biotin, methionine and chelated zinc for healthy hooves. 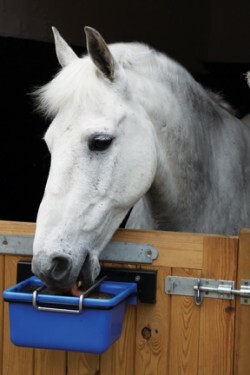 The nature of a lick enables equines to lick little and often and therefore digest the nutrients slowly and gradually in a natural trickle feeding process that mimics the way horses graze. This slows down the rate of consumption, complements the natural digestive system of the horse and helps to keep the horse or pony occupied and engaged.